One of the most controversial mines in Canadian history is under review in British Columbia. Losing Ground? The Struggle for Teztan Biny/Fish Lake is an 18 minute radio documentary recorded by two Victoria-based independent journalists in April 2010 in Williams Lake and in the remote Tsilhqot'in community of Nemiah Valley during the federal environmental assessment hearings for Taseko Mines' proposed "Prosperity Mine". The piece offers listeners an intimate look at a community that is deeply troubled by what is becoming a familiar debate in rural resource-based economies in Canada: Who gets to determine whether a mining “boom” is worth a potential “bust”? This question is couched in the much bigger issue of First Nations rights and title. 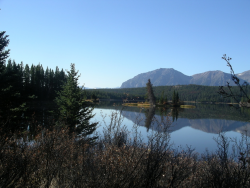 The piece features exclusive interviews with several First Nation chiefs and community members, as well as legal and scientific experts retained by the Tsilhqot’in National Government.